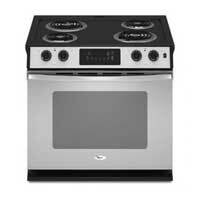 This drop-in electric range from Whirlpool seems appealingly wide and has a frameless door that provides full access to the oven. The black cooktop requires regular cleaning to stay clear and sparkling, but you run into that problem with most modern ranges. The baking and broiling settings for the oven are delightfully simple with one-touch buttons. Or, you can customize your own broil temperature in five-degree increments. For just $808, this Whirlpool model delivers consistent cooking performance and features a clear digital display for ease of use.